The majority of this recruitment has been due to growth. In April 2015 we had 20 testers, while in February 2016 we'll have 29 testers. We've also had a bit of churn due to internal promotions, maternity leave and people leaving the organisation. I enjoy getting involved in recruitment, because I enjoy shaping a team. There are a couple of community building strategies that I've advocated for during our recruitment over the past few months that I think have had a positive impact on our testing culture. Prior to my arrival, the hiring managers had collaboratively created a list of skills and experience for a tester. These included a minimum number of years in a testing role, a minimum number of years experience using our specific automation tools, experience in an agile development team, and preferably banking domain knowledge too. In the New Zealand market, people who fit all of these criteria are very rare. The kakapo of testing. Though I agreed that we needed all the skills we were seeking as part of the testing competency, I didn't think we needed them all to sit with each individual. Instead I wanted to broaden our hiring scope and choose people with complementary strengths. I felt this would still achieve the same end goal of a cross-functional testing team. I examined the testing capabilities within each tribe (a collection of agile teams who work on the same product) against four experience criteria: testing, automation, agile and banking. Through consultative subjective assessment of the existing testers, we identified the most important skills that we needed to look for in each hiring iteration. We've started to select candidates based on these priorities rather than looking for a person who has everything. Thursday reminder: Cross-functional teams DOES NOT mean cross-functional individuals. Not everyone needs to be able to do everything. As editor of Testing Trapeze and as a co-organiser of WeTest, I'm constantly conscious of accurately representing the community behind the forums through the voices we elevate. Similarly, in my coaching role, I feel a responsibility to foster diversity in the team that I support. It may not be perfect, but I'm proud of the diversity that image reflects. Prior to my arrival, there were very few testers with less than three years testing experience. I've been vocal in my arguments for hiring juniors as part of a balanced recruitment strategy. I'm happy with how the Testing Experience graph has shifted over the past six months, with approximately a quarter of the team now considered to be junior staff. 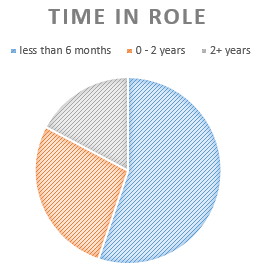 It's probably also worth noting that the testers aged in their 20s and the testers with 0 - 3 years of experience are not the same group of people, despite their identical pie graph segment sizing. We've hired inexperienced testers across a wide age range. I don't use any conscious strategies for gender or ethnicity, and our ratios in these areas are largely unchanged, but I feel they're relatively representative of our local community. The biggest benefit that I've observed in hiring for skills and team diversity is that it promotes a culture of learning. Where people bring different strengths and different experiences, it creates opportunities to learn from one another. The exchange of knowledge is personal and hands on, rather than learning online or from printed materials. This means that, in addition to imparting new skills or ideas, we improve collaboration between testers across teams and foster a sense of testing community. I believe in hiring for a team, not a role. Look at the whole picture and consider the tenets of diversity. I am a vocal advocate for hiring junior testers into our team. By junior, I mean a person with no experience in testing, regardless of age or other work history. I've been having a lot of conversations recently about why I believe we should hire juniors as part of a balanced hiring strategy. I'm curious to know how these points align to the thoughts of others who are involved in recruitment. I look for junior applicants who want to get into a testing role, in an agile environment, where they'll have the opportunity to pick up some automation skills, in the financial sector. In other words, I look for junior applicants who want the role that I'm advertising as opposed to any role at all. These juniors distinguish themselves by being prepared for their interviews, by having a series of questions about the role that indicate they've considered what the position will require them to do, and by demonstrating the ways that they have started their own study towards entering the profession. They make their desire plain to see. Hiring this sort of junior brings a driven individual into your organisation who is motivated and passionate about learning. In a supportive environment, this kind of attitude is infectious. Though juniors may not bring many skills, I believe they bring a unique thirst for knowledge that can revitalise the desire to learn in the people around them. Hiring a junior into a role that they don't yet have the skills to perform will obviously provide them with a huge number of challenges. However it also introduces challenge to the roles of those who will support the junior in their learning. I believe this is a good thing. When a junior starts with the organisation, we pair them with a senior buddy. The pair usually work in the same agile development team, sitting alongside one another day-to-day, for easy and contextual knowledge transfer. In a relatively flat organisation structure, being a buddy to a new starter is one way for our senior testers to get experience in mentoring and teaching. It's a responsibility that challenges our seniors to take ownership of developing a junior, by offering them new experiences and imparting their knowledge. Without juniors, we cannot offer this leadership challenge to our senior staff. I don't like hiring people who can already do a job comfortably on Day One. I think these are the people who get bored and leave within a relatively short period of time or, worse, they are happy to stagnate and occupy their role without developing themselves. The learning opportunities for a junior are the greatest of any type of hire. Their development path should be long and rewarding. It's growth that makes a role exciting, and creates loyalty between an employee and their organisation. A junior will feel grateful for being given the chance and support to shine. I believe that loyalty, paired with a healthy work environment, leads to lower staff turnover. I want to retain our testers. Hiring juniors feels like a great way to extend the period of time that people stay with our team. A junior candidate is, in many respects, an empty vessel. There are no bad habits to break, no misconceptions to correct, no terminology to redefine. Starting from scratch can be easier than cleaning up before you begin. Juniors are comfortable asking questions, because they know that there's an expectation that they will have to ask to learn. They bring very few assumptions, because they don't have any prior experience that taints their perspective. They are great at thinking laterally, because they've never had their ideas confined to a particular box. I believe that junior candidates have massive potential to be amazing testers. Providing an environment to turn this potential into a reality is essential, but their clean slate can be viewed as an asset for a testing role. I'd like to see more organisations hiring junior testers, not as a strategy to cheapen or deskill their workforce but rather as an investment to develop the next generation of testers. There is potential for junior hires to have vast positive impact and shape the future. Let's give them the opportunity. This pathway is designed to help non-testers tackle testing activities. 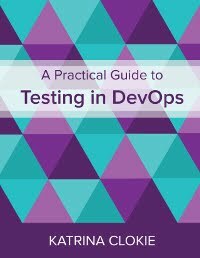 If you're asked to test something in your team, this is a set of practical resources to help you. Designed to help people with immediate questions like "How do I decide what to test?" Thanks to Steve Mosley & Anthony Boobier, the non-testers who helped refine this pathway. At work we're implementing a brand new automation suite for one of our internet banking applications. This is the first framework that I've introduced from a coaching perspective as opposed to being the tester implementing automation day-to-day within a delivery team. Aside from choosing tools and developing a strategy for automation, I've discovered that a large proportion of the coaching work required is to train the testers within the teams in how to install, use and extend the new suite. I've done a lot of classroom training and workshops before, but I felt that these formats weren't well suited to teaching automation. Instead I've used two practices that are traditionally associated with software development rather than testing: strong-style pairing and a coding dojo. I've been surprised at how well these practices have worked for our test automation training and thought I would share my experience. After a series of introductory meetings to explain the intent of the new suite and give a high-level overview of its architecture, each tester worked independently using the instructions on our organisation wiki to get the tests running on their local environment. As the testers were completing their installations, I worked in parallel to create skeleton tests with simple assertions in different areas of the application, one area per tester. To keep the training as simple as possible I wanted to split out distinct areas of focus for individual learning and reduce the potential for merge conflicts of our source code. "for an idea to go from your head into the computer it MUST go through someone else's hands"
For these sessions I acted as the navigator and the tester who I was training acted as the driver. As the testers were completely unfamiliar with the new automation suite, strong-style pairing was a relatively comfortable format. I did a lot of talking, while the testers themselves worked hands-on, and together we expanded the tests in their particular area of the application. As the navigator, I prepared for each pairing session by thinking up a series of objectives at varying degrees of difficulty to accommodate different levels of skill. My overarching goal was to finish the hour with a commit back to the repository that included some small change to the suite, which was achieved in two-thirds of the sessions. 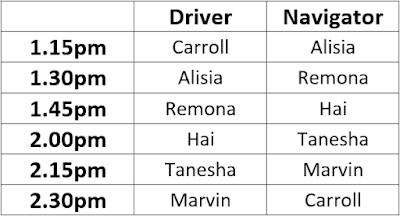 As a coach, I found these sessions really useful to judge how much support the testers will require as we progress from a prototype stage and attempt to fulfill the vision for this suite. I now have a much more granular view of where people have strengths and where they may require some help. I had a lot of positive feedback from the testers themselves. For me the success was that many were able to continue independently immediately following the session and make updates to the tests on their own. At this point everyone had installed the suite individually, then had their pairing session to get a basic understanding of how to extend an existing test. The next step was to learn how to implement a new test within the framework. I felt that a second round of individual pairing would involve a lot of needless repetition on my part, explaining the same things over and over again. 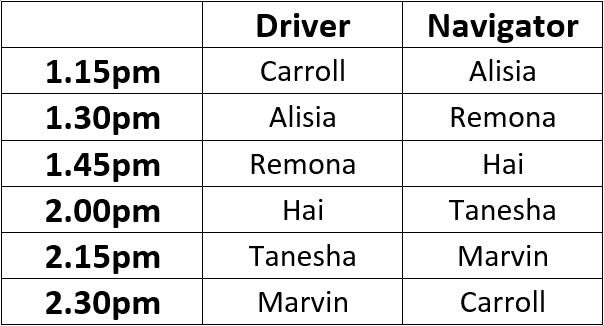 Ultimately I wanted the testers in the team to start pairing with each other to learn collaboratively as part of our long-running pairing experiment. I found a "how do you put on a coding dojo?" video and decided to try it out. I planned the dojo as a two hour session for six testers. I decided to allow 90 minutes for coding, with 15 minutes on each side for introduction and closing activities. Within the 90 minutes, each of the six testers would have 15 minutes in the navigator/co-pilot role, and 15 minutes at the keyboard in the driver/pilot role. On the morning of the session I sent an email out to all the participants that reiterated our objective, shared the timetable, and explained what they would not require their own laptops to participate. We started the session at 1pm. I had my laptop prepared, with only the relevant applications open and all forms of communication with the outside world (email, instant messaging, etc.) switched off. The laptop was connected to a projector and we had a large flipchart with markers to use a shared notes space. Then I sat back and watched the team work together to create a new test! Though I found it quite challenging to keep quiet at times, I could see that the absence of a single authority was getting the group to work together. It was really interesting to see the approach taken, which differed from how I thought they might tackle the problem. I also learned a lot more about the personalities and social dynamics within the team by watching the way they interacted. It took almost exactly 90 minutes to write a new test that executed successfully and commit it back to the repository. Each tester had the opportunity to contribute and there was a nice moment when the test passed for the first time and the room collectively celebrated! I felt that the session achieved the broader objective of teaching all the testers how to implement a new test, and provided enough training so that they can now work in their own pairs to repeat the exercise for another area of the application. I intend to continue to use both strong-style pairing and coding dojos to teach test automation. Your first conference talk will give you exposure to writing an abstract, marketing your ideas, creating engaging slides, structuring a talk, speaking clearly, keeping to time, and so on. The more talks you do, the more experience you gain in those same activities. But developing as a speaker is not just about opportunity for repetition. I see a change in speakers when they stop thinking so much about what they're going to say during their talk and start concentrating on how they're going to say it. By that I mean, when a great speaker is on the stage their content is almost on autopilot. They're not worried about the points they need to cover on the next slide. Rather they're more aware of their delivery. They're operating at a meta-level. So, what sort of things are these great speakers thinking about? A new speaker is learning to feel comfortable making eye contact with the audience. A great speaker is learning to anticipate mood, read body language, understand the response of the audience, and adapt their presentation to react to that environment. Look at the schedule for the event. How long ago did people have food? How many concurrent sessions have the participants sat through? Whereabouts in the day are you? Whereabouts in the conference? Think about these factors as you watch the audience arrive in the room. Is there energy or will you have to create it? How do people sit down? Do you see many people with their arms folded or their legs crossed? How many people have an open posture and are tilted forwards in their seats? Are people receptive to your ideas or will you have to establish your credibility and use persuasive language? When you change the slide in your presentation, how many eyes travel to the slide and then back to you as the speaker? Who isn't making eye contact with you at all, looking downwards, or out the window? Are people engaged or do you have to ask for their participation to draw them in? Are there people who are still reading a slide when you switch to the next one? Are people zoning out between slide transitions? Look for signs of frustration, like people sighing or pulling out their phones. These may be indicators that you need to change your pace. The audience won't change the key messages of a presentation, but a great presenter will allow them to massively influence its delivery. A new speaker will often include remarks in their own presentations that are about their delivery rather than about their content. It's analogous to playing the director's commentary across a movie, however in a conference presentation these remarks are often apologetic or self-deprecating. Do you start your talk by undermining your own credibility or wondering aloud whether you're really an authority on your topic? Do you question the choices of the organisers who granted you a spot on the stage, or the choices of the audience for selecting your session to attend over other alternatives? Do you tell people how inexperienced you are at speaking or how nervous you feel about this presentation? Do you apologise for fumbling content or narrate your disappointment in failed technology? I believe that eliminating this sort of commentary from your presentation creates a perception that you're a very confident speaker, regardless of how confident you actually feel. I have a heuristic to mute this doubt track within my own presentations. When thinking about whether or not to vocalise something I like to first consider who I'm saying it for. Often the commentary is stuff I say to make myself more comfortable, or to settle myself in to the beginning of my presentation. It's not for the audience. And if it's not for the audience, I shouldn't say it. Related to audience, the same presentation may differ wildly in delivery through choice of language. Can you interact informally, use colloquialisms, and make jokes? Or should you take a more professional tone? Choice of words is influenced by environment. Are you speaking at a MeetUp event or a formal conference? It's also influenced by culture. Your references and examples may change between a talk in New Zealand versus a talk in India. You might also consider whether jargon appropriate for your audience. What terms will they be familiar with and which should you explain beyond an acronym? Adjusting to these factors can make a big difference in how accessible and relatable your presentation is. A great speaker can deliver the same slides twice, in two different contexts, with what may feel like an entirely different speech. The key messages don't change, yet the words are altered for the greatest impact. If you're feeling ready to tackle the next challenge in public speaking, start practicing these meta skills. Think about your audience, your commentary and your language in your next presentation. Over the past week, I've had a few conversations about writing a blog. As a result, I thought I'd record my approach to blogging, to try and encourage a wider group of people to write. Here's how I get from idea to tweet. I prefer to write about things that I care about right now rather than work from a backlog of ideas. I tried a backlog of ideas once, but it didn't really work for me to have a bucket of potential topics to write from. I found the choice to be paralyzing rather than enabling. I like to think of a real person who would potentially get value from my thoughts, then write the post for them. This helps me to pitch the tone of my writing - not too condescending and not too complex. I also find writing to an individual easier than writing to a generic group e.g. Bob vs. "testers who want to start blogging". I write my posts by paragraph. I'll type out my ideas, almost in a train of consciousness, then go back through the words and refine them into something that reads nicely. Realising that my thoughts don't have to come out perfectly the first time has really helped me to write more freely. When I finish a post, I read through it in my blog editor. Then I also read through it in the preview version to see it in the layout that will appear on my blog. Even when I think I'm done, looking at the words in a different format will often prompt me to change phrasing and pick up spelling mistakes. It's a fresh perspective for my brain. When I look back at my earlier blog posts, I find them pretty embarrassing. I imagine that when I look back on this post, and others of this era, I will find them embarrassing too. I feel that my writing is improving the more that I blog, so I try to keep practicing to maintain this evolution. I have a self-imposed target of three blog posts per month. I don't always hit that target, but I find that it motivates me to write. Without this, I am prone to getting stuck in writing ruts where my head won't settle on a topic and I can't identify people who will care about what I have to say without doubt creeping in. What I write doesn't have to be something that everyone likes, or universally useful, or shared widely across the world. I figure, at a minimum, it's valuable to me to write my blog. I get better at writing, I work out how to articulate my ideas, I develop a voice. I find it easier to consider pleasing others as a bonus. I always tweet when I write a blog. It's difficult for people to get any value from what I'm writing if they don't know it's there. I also like getting feedback from the community. Because sharing is circular, I also try to promote writing from others by tweeting content that I enjoy and having a list of blogs I follow on my site. If blogging is something that you'd like to start, or you'd like to do more of, it's likely that the only thing stopping you is yourself. I hope these tips encourage you to write. I look forward to reading what you have to say. 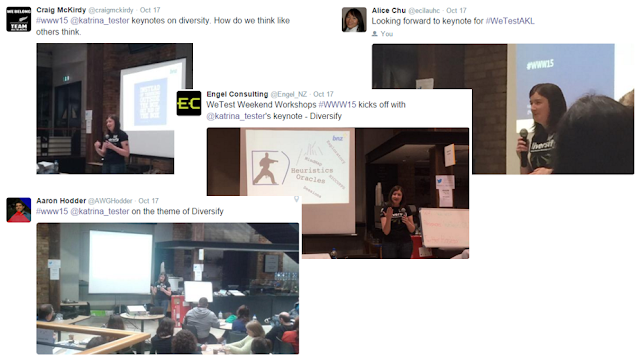 I spoke at a number of conferences over the past month or so. After each talk I received a variety of feedback, from a variety of channels. The genesis for this post is two pieces of feedback I received for the same talk at the Canterbury Software Summit. 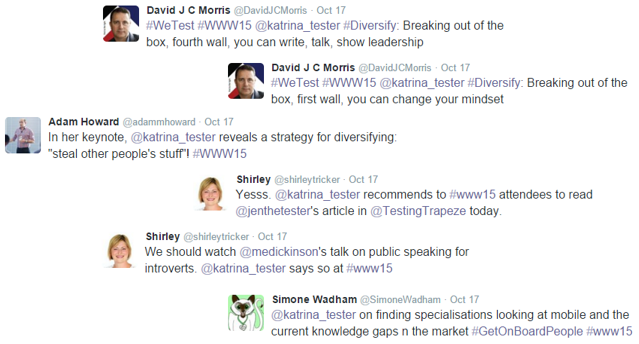 "Good coverage of the topic; however: agile teams/tribes should be self-sustained. Katrina's presentation though was explaining management activities. What I missed was how the agile approach really works for BNZ, how they constantly improve, what issue and challenges they faced and face etc. Missing enthusiasm. Average slide quality." 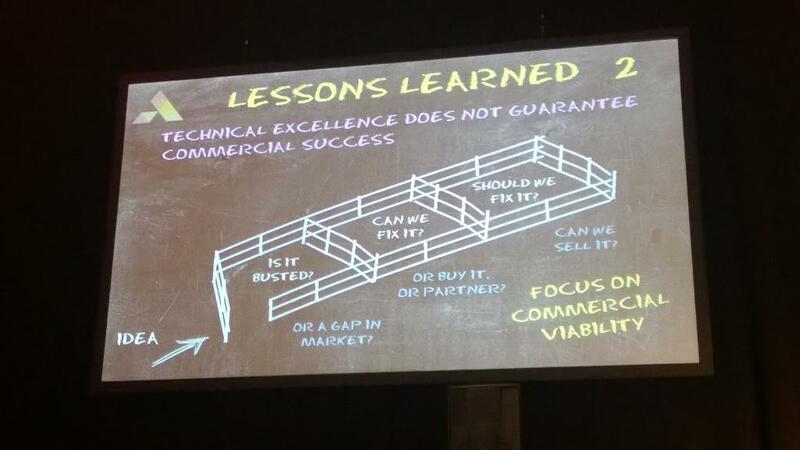 "One of the guys at work I talked to today, appreciated your talk at Canterbury software summit. We're thinking of now trying some of the ideas you talked about. Katrina please keep using your gift of inspiring the testing community, as it makes our jobs more enjoyable and fruitful." As you can see, one person was utterly underwhelmed while the other felt inspired and motivated to make changes in his organisation. As a new speaker I had no frame of reference for feedback, or any notion of what to expect back from the audience when I delivered a talk. Had I received that first piece of feedback for my first presentation I would have been entirely disheartened. Now that I've presented a few times, I'm starting to see patterns in when I receive feedback, what type of feedback it is, and how I can use it. 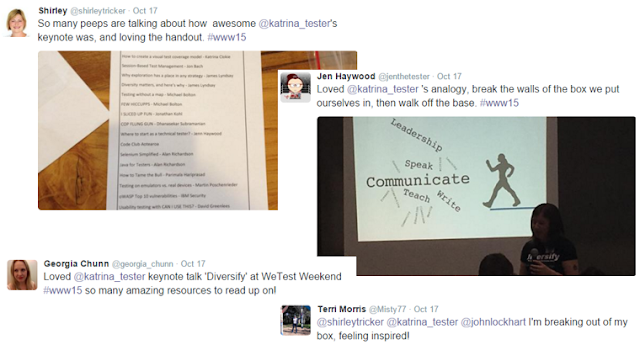 To illustrate, here's the feedback I received after my 'Diversify' keynote talk at the recent WeTest Weekend Workshops. I find public speaking a taxing activity. At the end of the talk, my adrenaline is racing - I know it's all over and I am looking to get away from people for a few minutes to calm down. However, there is usually at least one person who comes to the front of the room to speak to me. I like that people do this. The things they wish to say are usually positive and it's good to get immediate validation that it all went okay. Unfortunately I usually don't remember the nice things that they've said, because my brain isn't working properly yet! Occasionally I get immediate feedback of a different kind. At WeTest Weekend Workshops someone approached to suggest how I could improve my use of the handheld microphone. Strangely I always remember this sort of feedback, the things that aren't entirely positive, despite being in the same agitated mental state. I consider the number of people who come to the front of the room after my talk to be a loose indicator of the emotional response of my audience. The more people, the more I feel like I spoke about something that really resonated for them. After my talk I like to find a quiet spot, take a few deep breaths, and then check the reaction from Twitter. I see three broad categories for the feedback that appear in my Twitter timeline. The first tweets are the people who simply say that they are attending my talk. Announcement tweets contain no judgement and no content. Often they contain a photo from near the start of the presentation. As I've started to gain a wider following on Twitter, I think the number of people who announce that they're at my talk has increased. As a new speaker, very few people got excited about merely attending my sessions! I consider announcement tweets a loose indicator of my reputation in the community behind the conference. The next tweets will be the ideas from my talk. These might be pieces of content that resonated with people, summaries of my main points, or tweets that let people who are not in the audience know that they've been mentioned. I consider idea tweets a loose indicator of how engaged people are in the content. In some respects I prefer that there are fewer of these type of tweets, as I believe that most people find it difficult to actively listen while also composing the perfect 140 characters on Twitter. Finally there are the tweets that come at the end of the talk. Reaction tweets are all about judgement, though on Twitter you're usually just going to get the happy vibes from people who loved it and felt inspired. Reaction tweets are about the buzz. I consider these a replacement to coming to the front of the room after the presentation, and so treat them as the same loose indicator of the emotional response of my audience. The more reaction tweets I get, the better. Even if they're not all positive, at least I touched a nerve! If the event information has been published online, via Meet Up, Facebook, or some other alternative, there is usually an opportunity to post feedback. I find that the feedback I receive via social media comes from people who feel a connection to me as an individual, or who are confident about expressing their opinions to a wide audience. By contrast the feedback I receive via the event page comes from people who I do not know well, those who need longer to process their reaction to the presentation, or those who are not on Twitter! There is also a shift in language. People have had time to reflect, so their reaction is less emotive and more analytical. On Twitter people "love" the presentation while on Meet Up it's "great". Providing feedback via Meet Up requires effort beyond the time frame of the event itself. I consider this feedback a loose indicator of how I've improved my standing in the community behind the conference. Many conferences send out a post-event survey to all the attendees to help them improve their format, content and structure for the following year. Survey feedback is anonymous and, of all the forms of feedback, gives the widest spectrum. It seems that once there is no association between your feedback and your name, people become remarkably honest. Keynote was useful and aligned with the theme. Might have been even better if we had a more diverse speakers. The talks I attended were average from my perspective. Did not find it as useful as I thought it would be. Suddenly there's a much richer picture that includes those who had a less enjoyable experience. At conferences without a survey form, the only negative feedback you receive may be the absence of positive feedback. I consider survey feedback a loose indicator of what I can improve in my presentations. I don't listen to everything, and where there are clearly other factors at play I take the criticism with a grain of salt, but overall I find it a valuable source of information to help me refine my content and delivery. Finally, there are people who want to share the talk with others. I take blogs, and other post-event activities of this nature, as a form of feedback. I treat these as a loose indicator of lasting impact. Over the past couple of weeks I've been challenged to rethink how I advocate for change in testing. Here are four ideas, from three different conferences, that I hope will improve my powers of persuasion. At the Canterbury Software Summit in Christchurch, Shaun Maloney talked about how technical excellence does not guarantee commercial success. You may have a beautifully implemented piece of software, but if you can't sell it then it may all be for naught. Shaun shared his method of determining commercial viability of an idea using the following questions. Is it busted? Can we fix it? Should we fix it? If the answer to all three questions is 'yes' then he believes that there is merit in pursuing the idea. If, at any stage, the answer is 'no' then the idea is abandoned. This made me wonder, when I advocate for change, how often do I fail at this first gate? If the people I'm talking to just don't think that the testing we do now is busted, perhaps they mentally kill the conversation before it even begins? I think testing is ripe for reinvention. If talking about how things are broken isn't working, perhaps we'd have better success in focusing on the areas where people experience moments of doubt, desire or dissatisfaction? At the Agile Testing Alliance Global Gathering in Bangalore, Renu Rajani shared some information from the World Quality Report 2015-2016. This report is compiled by CapGemini, HP and Sogeti. This year they interviewed 1,560 CIOs and IT and testing leaders from 32 countries. 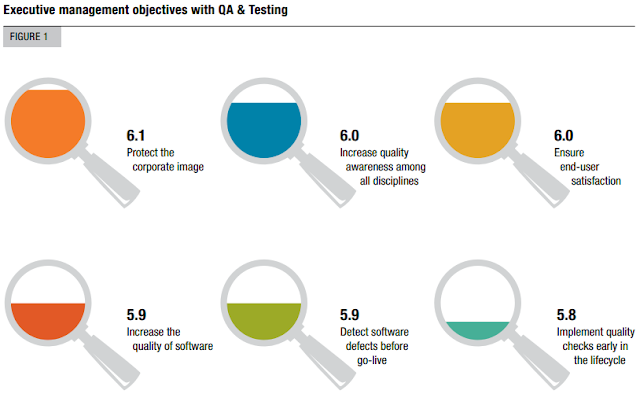 For this group, detecting software defects before go-live was the fifth highest priority. we will reduce the cost of testing through a more pragmatic approach. I have never spoken about corporate image, how we increase quality awareness among all disciplines, or how we improve end-user satisfaction. My arguments have always been based on assumptions about what I believe to be important to my audience. This data from the World Quality Report has made me question whether my assumptions have been incorrect. "ISTQB gives you the background and history of testing, along with testing techniques like boundary analysis, state transition diagrams, etc. CDT gives you the critical thinking side. Agile gives you the wider development methodology." Would "the critical thinking side" be something close to your single sentence statement about context-driven testing? What would you say instead? John's casual remark made me realise that I may be diminishing the value of my ideas when I summarise them to others. I see an opportunity to create a more compelling narrative about change in testing. I'm planning to stop arguing that testing is broken. Instead I'm going to start thinking about the moments of desire, doubt and dissatisfaction that exist in our test approach. I'm planning to stop talking about bugs, time and money. Instead I'm going to start framing my reasoning in terms of corporate image, increasing quality awareness among all disciplines, and improving end-user satisfaction. I'm planning to stop using impromptu sentences to summarise. Instead I'm going to start thinking about a sound bite that doesn't diminish or oversell.